Hello and welcome to this month's Blogging Friends Blog Hop! This month we have a very special hop for you. Not only are we all focusing on Saleabration products, but we have a very special guest hopper with us this month. 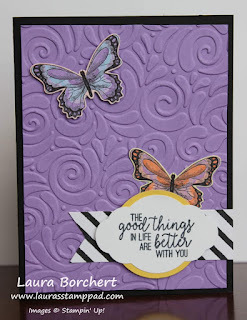 This month we have the very wonderful and talented Laura Borchert of Laura's Stamp Pad joining us. I started watching Laura's YouTube Channel the year that I signed up (a little over 3 years ago) and loved her style and honest simple style. Not to mention her love of flowers was a big draw since I have that same love. Laura has been a demonstrator for about 14 years now and if you talked to her you would think that she had just started with her love and enthusiasm for the Stampin' Up!. Her attitude is contagious and refreshing knowing that she has been a demonstrator for such a long time. I got the opportunity to meet her in person in Orlando at OnStage in November. And, I was super excited to talk to her a little while we stood in line to go into CenterStage. We came very friendly and talked for awhile. I was super excited to have her agree to hop with us this month. During our conversation via Facebook after we got home from Orlando and I asked her if she would be interested in joining us we decided that she would hop with us in February and she already had a card for our theme and so we talked about her thoughts on adding to our theme this month and adding in the CASE the designer aspect. And, she was super excited to do so and sent me a picture of her card right away. If you don't know what CASE means; well it means COPY AND SHARE EVERYTHING OR COPY AND SELECTIVELY EDIT. As card makers and designers we do this sometimes when we find a design that we like, or want to recreate. CASEing is a great way to improve your own design skills. Here's the card that Laura sent me as part of our inspiration for this month's Hop. Laura gave us a fun card to CASE for today's hop. Here's a look at my card based on her's. 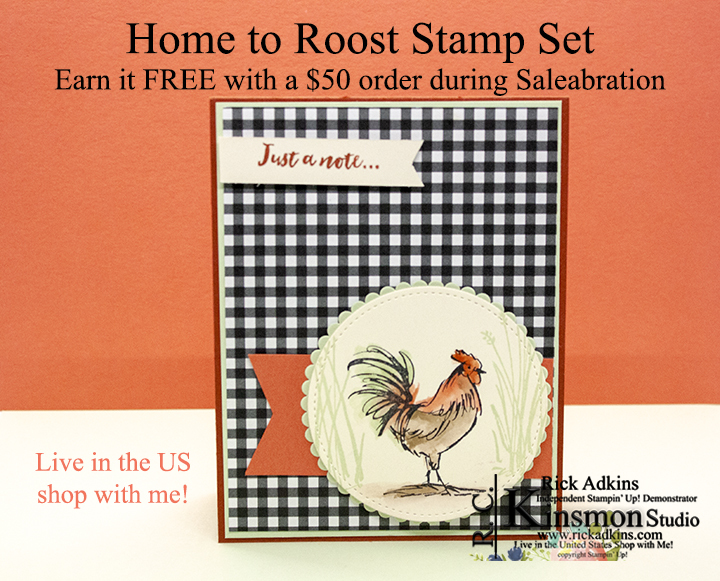 I used the Home to Roost Saleabration Stamp Set for my card, along with a piece of the Botanical Butterfly Designer Series Paper. Both of which are Saleabration items and can be earned with each $50.00 purchase in my online store. I replaced the embossed background from Laura's card with the Botanical Butterfly Designer Series Paper. This allowed me to keep the texture but change it a little. I then stamped the rooster from the Home to Roost Stamp Set on a piece of Whisper White Cardstock with Stazon ink and used my watercolor pencils to color it in. I then cut it out with one of the stitched circles from the Stitched Shapes Framelits. After die cutting the image I stamped the grassy image on each side of the circle in Soft Sea Foam classic ink. 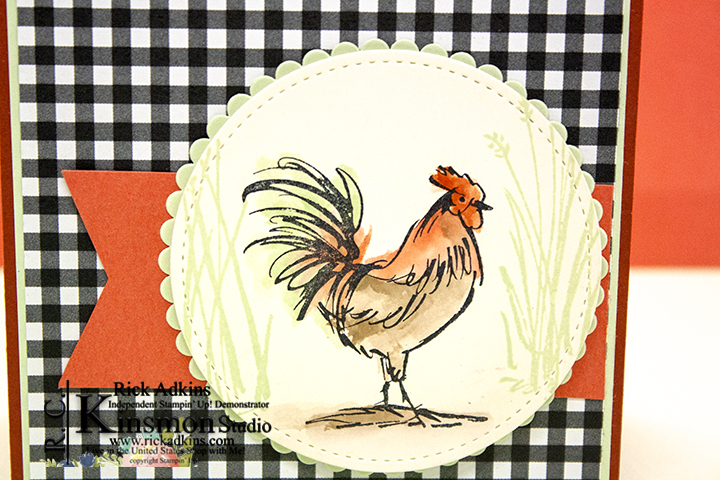 I added a large scalloped circle in Soft Sea Foam behind the rooster image. I then added a piece of the Botanical Butterfly Designer Series Paper cut at 5 1/4 x 4 to a piece of Soft Sea Foam cardstock (4 1/8 x 5 3/8). 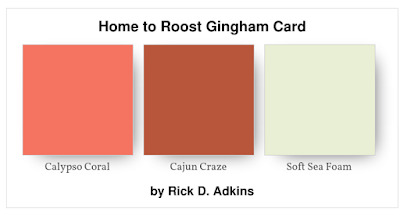 I attached this piece to the card base which is in Cajun Craze (4 1/4 x 11 scored at 5 1/2). Behind the rooster I added a fish tail banner in Calypso Coral. Here's a look at the colors that I used for my card today. This is one of those unexpected color combinations that you probably wouldn't think of right off the bat, but works very well together. Both the Calypso Coral and Cajun Craze are in the red family on the color wheel and since Green is the complement of Reds it works wonderfully when paired together. 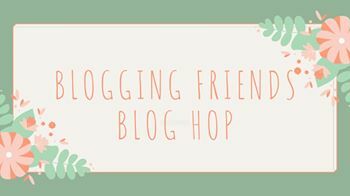 I hope that you have liked my card today, and that you have a fun hopping along with us for this month's hop. 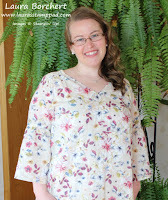 You will find a full list of the supplies that I used for my card today below the blog roll. If you view this post on my Wordpress site and not on my new blog the blog roll will be up shortly on it. Rick this is so awesome! I adore how you colored the rooster! And the black plaid is just perfect!!! Hey Rick. Love your card. I wasn't all that keen on the Rooster set myself but your card makes we want it now. Love the different colour combination as well. Beautiful card, Rick!! I LOVE that DSP and this rooster is a sleeper in the SAB brouchure. My favourite. 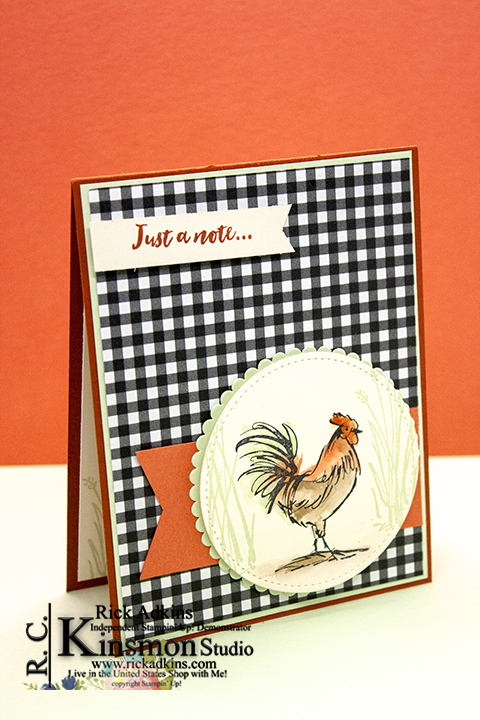 Super cute CASE using the rooster in your design!